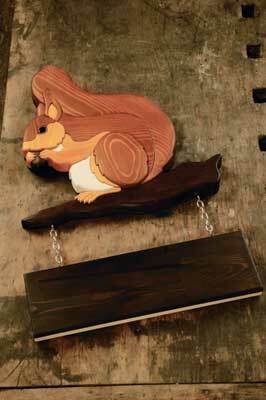 This unique and eye-catching squirrel, holding up a house name or number plate, would look impressive hanging at the front of any house. Rather than fill the pages with examples of various letter styles, we have left the choice of font to you - there are countless ones to choose from in craft pattern books and on the internet, or you can use one of the fonts available on your computer. Of course, there is nothing to stop you simply drawing your own letters. 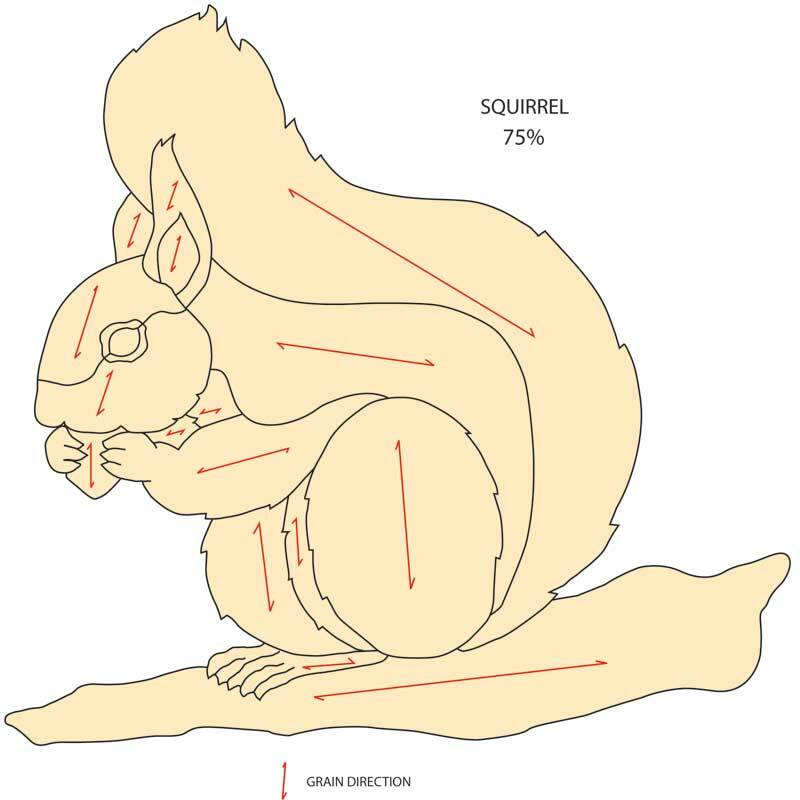 Enlarge the squirrel pattern to 305 x 305mm, taping two sheets of paper together if necessary, and make six photocopies. 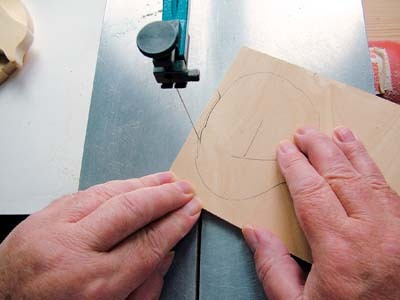 Cut the patterns into six sections, according to the grain-direction arrows, and align each section with the grain of your wood. 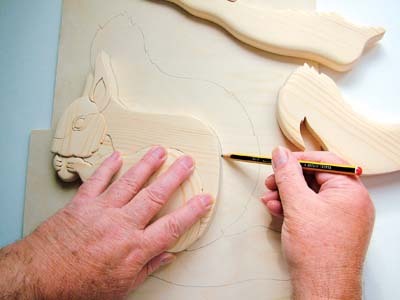 When you are happy with the layout, attach the patterns to the wood using the glue stick. Fit the scrollsaw with a No.7 blade. 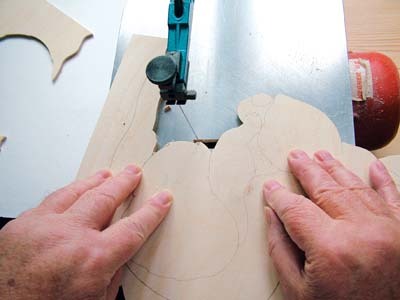 Before cutting, make sure your wood is flat. 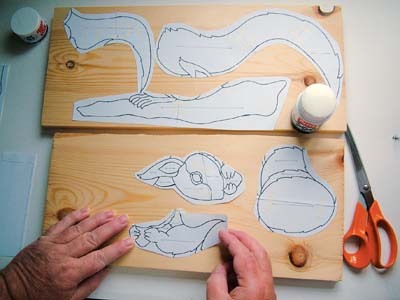 Start by cutting out the hind leg and tummy piece, then the arm section, checking the fit of each component against the adjoining pieces as you go. Mark the underside of each piece, to ensure that you sand the right-side later on. 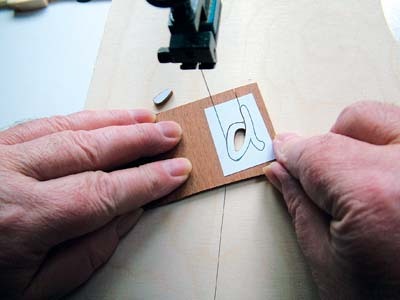 ..then cut just inside your line so the backing piece will fit easily in place behind the other timber pieces. 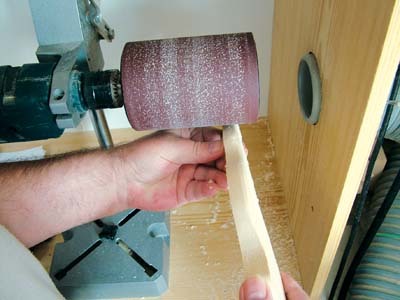 Use the drum sander to round over the outside edges of the branch, working with the grain and following the contours of the wood. 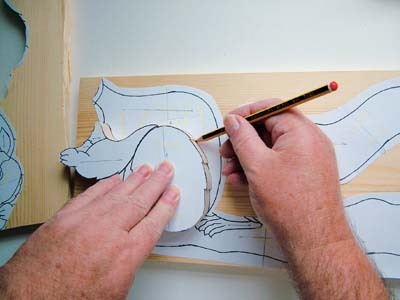 Then, using a sharp pencil, mark the height of the branch onto all the adjoining pieces: foot, hind leg and tail. 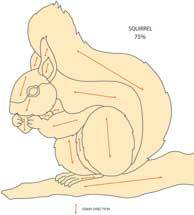 Sand and shape round the nut and right ear pieces, and again mark the height onto all adjoining parts. Shape the tail by rounding over the outside edges, lowering it more toward the top, so the left ear stands higher by approximately 1/2mm. Be careful not to sand below your height marks for the right ear and branch pieces. Sand the outer edge of the tummy round, and then transfer the sanded shape onto the foreleg. The foreleg and back pieces need hardly any sanding at all. Sand down the inner ear by about 1mm, so it's lower than the outer ear piece. Mark the height of all the pieces around the head and then hold the two pieces of the head together while you sand the edges round. 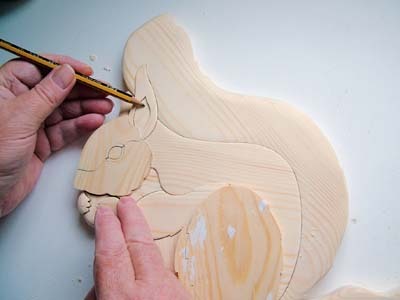 As you sand the remaining pieces, try to visualise the shape of the squirrel - if you're unsure how much to take off, sand a little at a time and try the piece in position before sanding further. You can sand more timber off, but not glue any back on! When you are happy with the shape, hand-sand the pieces, first with 120 grit paper to remove the imperfections from the drum sanding, then moving on to 180 and 280 grit for a really smooth finish. Remove the dust with a soft brush, followed by a tack cloth. 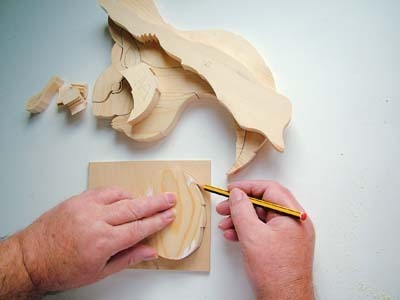 Assemble all the pieces together onto the 6mm plywood, then using a sharp pencil, draw all around the outside edge. Now remove the six main sections one at a time, so that you can trace around the remaining pieces. 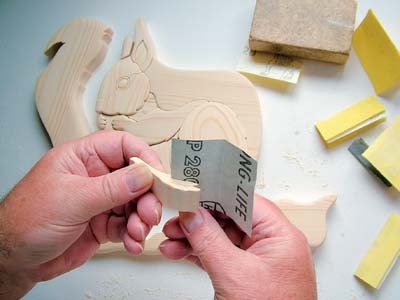 Change the scrollsaw blade for a No.5 and proceed to cut out the backing. Apply a sanding sealer to the back, and an acrylic matt black paint all around the edge to give a more finished look. use a thick black marker pen to go over your pencil lines, so that if you do have any small gaps between the pieces, they will not be so noticeable to the eye. to the appropriate pieces. 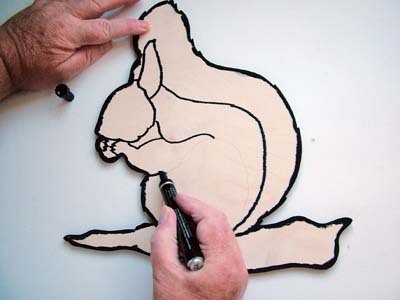 After colouring each piece, wait a brief moment and then remove the excess stain with a soft cloth. This will eliminate any brush marks, so all you see is the grain of the wood. Allow the pieces to dry completely, then very lightly sand with 320 grit paper and use the tack cloth to remove the dust. 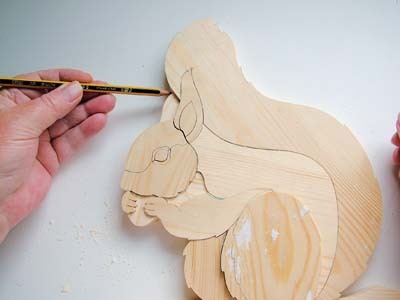 Apply a coat of exterior varnish to all the pieces and again allow to dry. The unstained piece is the plywood backing for the hind leg. 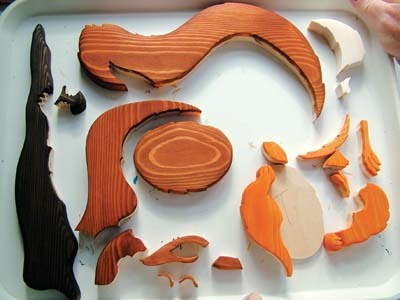 Lay out the pieces in order for gluing. 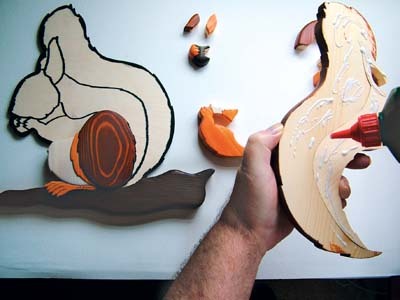 Start at the bottom by gluing on the branch, then move upward until all the pieces are securely stuck down. Don't forget the plywood packing piece behind the hind leg. Wipe away any glue that may have seeped out with an old acrylic brush and a damp cloth. 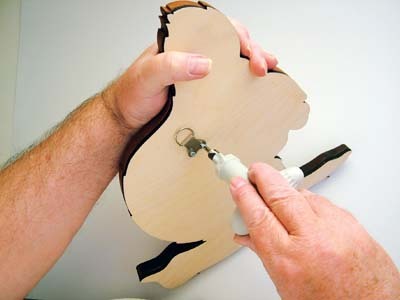 Leave the squirrel on a flat surface until the glue has cured. We made our pine name plate 305 x 95 x 19mm. Sand with 120 grit paper on a sanding block, slightly rounding the edges, then change to 180 grit for a smoother finish. Once you have chosen from the countless fonts available - or designeD your own, write out the name you require and use the photocopier to enlarge or reduce it to fit the size of the name plate. Choose between dark letters on a light background, or light letters on a dark background. Fit the scrollsaw with a No.1 blade, and attach a false plywood table if you do not have a zero-clearance insert. 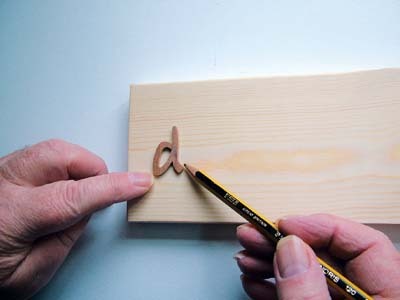 Cut out the letters, remove the paper patterns and lightly sand the top and edges with 320 grit sandpaper. Carefully arrange the letters or numbers on the name plate, then remove one at a time and glue into place. Allow the glue to cure, then apply a coat of exterior varnish and again leave to dry. The dimensions given for the name plate are what we used - feel free to change them if they do not suit your house name or message.